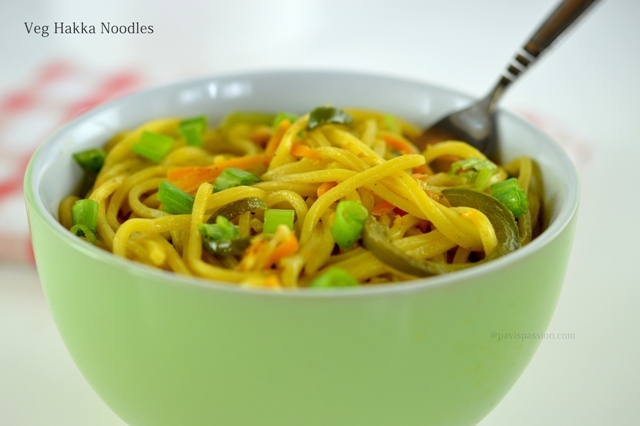 Vegetable Hakka Noodles is Indo Chinese recipe which have a great Chinese flavour and taste. Its very popular dish and it can be liked by all the ages. Whenever we go for a restaurant we order the Hakka noodles it flavour and taste attracted us always. 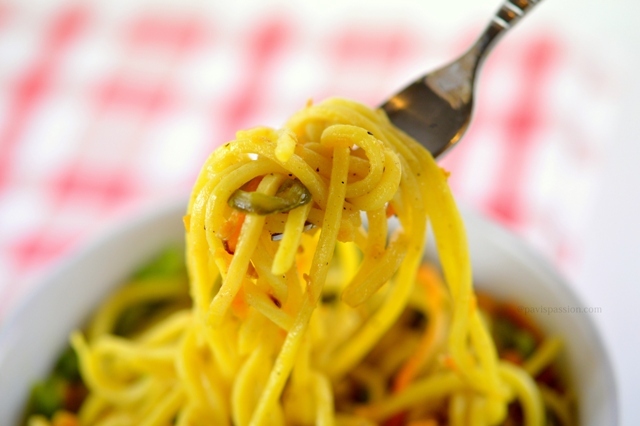 I want to this recipe at home, the best i tried is the Hakka noodles recipe. It is easy to make and gives a great taste and flavour. Do and choose Chinese noodles(bigger size) to make this recipe.Choosing the spring onion gives a right taste and nice flavour for it. 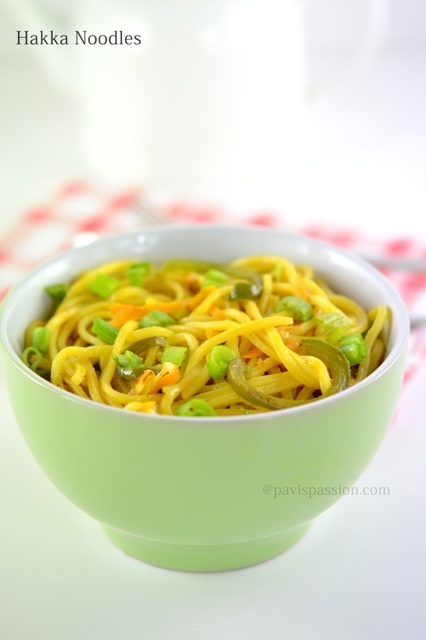 Try this easy Hakka noodles and attract your kids with a Chinese flavour. Hope all will enjoy this recipe. Any queries and comments are always welcome. 1. 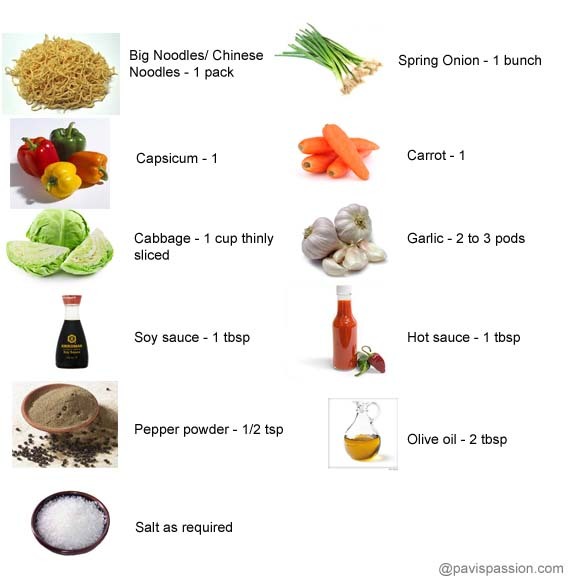 Boil Water in a vessel add Salt and noodles in it. cook the noodles. In between chop the vegetables capsicum, carrot, and cabbage in thin long strips, white part of spring onions and garlic into fine pieces. After the noodles is done drain in a strainer and wash with cold water, drain and keep it aside. 2. Heat 1 tbsp of oil in a pan, add the garlic pieces into it and saute. Add the chopped white part of spring onions and saute for a minute. Put in high flame and add all other three vegetable and fry until it crispy. 3. When all sauteed well, Add soy sauce and little salt and saute for a minute. 4. Add the Hot sauce and pepper and mix well. Then add the cooked noodles and mix thoroughly in highly flame for 3 minutes. Add Olive oil if required. Garnish with green part of Spring Onion and serve Hot.